Terror group praises Israeli-Arab terrorist who ran down security personnel, 'he proved how determined the Palestinian people are'. The Hamas terrorist organization praised Sunday’s ramming attack in the northern Israeli city of Akko, calling the attack “heroic and brave”. 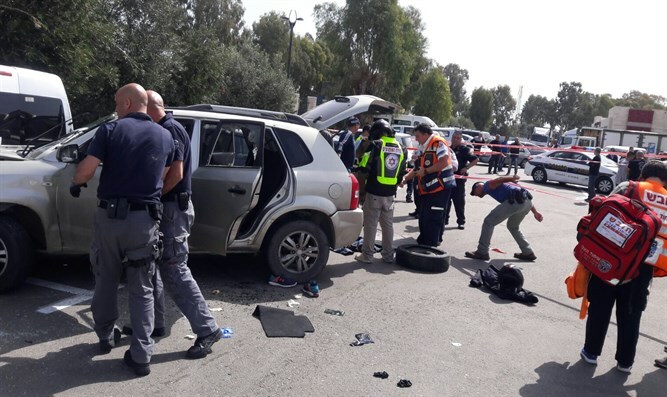 Earlier on Sunday, an Israeli Arab terrorist rammed an Israeli Border Police officer and IDF soldiers at two different locations in the northern coastal city of Akko before being shot and neutralized. The terrorist was later taken into custody and evacuated for treatment. His condition is listed as moderate. Police later confirmed that the incident was intentional, and that the attacker had acted out of nationalistic motives. Later on Sunday, the Gaza-based Hamas terror group praised the attack, hailing it as “heroic and brave”. A Hamas spokesperson further claimed that the attack was a testament to the “determination” of the “Palestinian people to continue in their use of resistance” to defend their land and holy places. Hamas urged others to continue the use of “resistance against the occupation”, a veiled reference to terror attacks against Israeli civilians and security personnel.